Charles Tetteh, a Ghanaian, attended Olathe, Kansas, Free Methodist Church, while he furthered his education. While there, his call to serve God through preaching was renewed, and he desired to bring the Free Methodist witness to his homeland. Charles and his wife, Fredericka, returned to Ghana in June 1998 and planted the first FM church in Accra. Barrie FMC initiated involvement in Accra in 2005, developing a ministry partnership that has resulted in significant growth of the already existing single Free Methodist congregation. In 2009 the Ghana Mission District came under the oversight of The Free Methodist Church in Canada as the result of sustained Canadian interest in the work there. Today there is a growing fellowship of new churches, with ongoing ministerial training and organizational development. National leadership in Ghana assume responsibilities for overseeing ministerial development, church planting and organizational accountability. 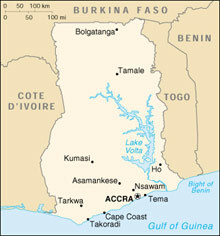 The work is developing most significantly in the centre and north of Ghana, the most unreached regions of the country. These are largely Muslim background areas.